"The inconveniences experienced by Barbara Warren and Madan Bhasin, two acquaintances/coworkers of mine at the former Union Carbide Corp. Technical Center in South Charleston, W.Va., were interesting and worth noting (C&EN, March 3, page 4). However, equally pertinent are potential unknown dangers caused by the presence of 4-methylcyclohexanemethanol (MCHM) in our water supply for several months. For example, my physician (Steven Zekan, who has an office on Kanawha Boulevard in Charleston) brought to my attention some white, opaque rubber tubing (~3/8 inch outside diameter) used in instrumentation in his office and that had become nonfunctional. The tainted city water had been sitting in the tubing for about two to three weeks. The rubber tubing no longer possessed the elastomeric properties of rubber. 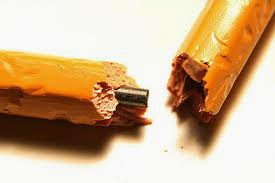 It had become hard and brittle and snapped like a wooden lead pencil. I have not seen mention of this deleterious effect of MCHM on rubber in Charleston’s newspapers or local TV, which summarized the LD50 from the material safety data sheet but not other properties of the chemical. Our preliminary observation suggests several lines of inquiry. Do the Freedom Industries storage tanks contain any gaskets that could have deteriorated? Also, Charleston residences would do well to keep an eye out for the possible embrittlement of rubber items such as hoses, washers, gaskets, seals, and the like in their home appliances including dishwashers, hot-water tanks, and toilet tanks by having been exposed to water tainted with MCHM." The first paragraph is fine, but in the second one, the wheels fall off. "Rubber" How do you know it is rubber, natural or synthetic and not an elastomeric material? "~ 3/8 inch outside diameter". And what does the diameter, especially the outside diameter have to do with any of what is about to be discussed? "The rubber tubing no longer possessed the elastomeric properties of rubber" This is rheologically incorrect. Even very brittle materials such as ceramics still show elasticity. "...snapped like a wooden lead pencil" With jagged edges and fibrous matter perpendicular to the direction of the break? So now that the author has anecdotal evidence of tubing degradation that may or may not have been the result of MCHM exposure (where's your control sample? ), it's time to make the big leap and warn of how ALL rubbers are at risk, such as hoses (which are not rubber but PVC in many cases), washers, gaskets, seals and the like which again, may or may not be rubber. It certainly is possible that MCHM exposure caused the noted tubing to fail. Failure of polymeric materials can be extremely difficult to predict, particularly if the parts are under stress or have already been partially degraded by other exposures (ozone, UV light,...). A perfect example is Environmental Stress Cracking in polyethylene, where exposing plastic parts under stress to water-based surfactants can cause failure. [*] Having to take a guess at this case, I would say solvent-induced crystallization. But that hypothesis is hardly proven here, irrelevant information is included as if it is pertinent, poor analogies are given, and worst of all the total mischaracterization of what rubber is and what is made of rubber. It is very disappointing to see an ACS member write such a technically incorrect letter. Hat tip to Chemjobber for bringing this to my attention, even if it was on Memorial Day. [*] Before you go about hypothesizing a failure mechanism, make sure you can also explain why polypropylene doesn't fail in this manner. As more proof that the petroleum is not going to disappear anytime soon, look at what Saudi Aramco is planning: $100 billion in capital investments in downstream chemical refining. Keep in mind that Saudi Aramco is the world's largest company worth about $10 trillion with revenue of just of $300 billion, so $100 billion over 10 years is a paltry 3% investment rate. But again, more proof that the oil industry is going to be around a lot longer than anyone thinks and also proof that complaining about ExxonMobil "buying" politicians or government influence isn't paying much attention to how big "big oil" is and who is part of it. So while Saudi Aramco is making money faster than a haywire printing press, other businesses are losing it with just as much intensity. Amerityre has announced yet another quarterly loss. This is now 75 continuous quarters of losses. How the company survives is beyond me. Plastemart is reporting that SABIC is getting ready to launch its first portfolio of certified renewable polyolefins. "“We have optimized our technology to allow the production of renewable PP and PE using renewable feedstocks, which are made from waste fats and oils and are not in direct competition with the food chain, with equal performance to those produced with fossil fuels." I'm assuming that the technology will take the feedstock(s) and convert them into ethylene and propylene, which can then be polymerized the same as petroleum based feeds. This echoes the position that I took less than 2 weeks ago, that petroleum will disappear, but polyethylene production won't. Polyethylene and polypropylene are here to stay. About 25 years ago, a colleague of mine had a sign in his office: "Sometimes you just have to shoot the engineer and start production", which summarized his obvious contempt for engineers and their theories. It also applies to what I am about to say. From the Journal of Chemical Education comes a writeup about a waterless condenser, shown on the right. It is just a standard condenser, but instead of being connected to a water line or circulating pump, it is filled with ethylene glycol and a short span of tubing connects the two outlets. It is a simple, reusable setup that avoids either the waste of clean water or the complications of a circulating pump. Being formally educated as a chemical engineer, my engineering sensibilities are seriously suffering from looking at this. A condenser is an apparatus for heat transfer and little more, with the heat going from the hot solvent through the glass and then into the fluid. And so I will analyze this from a heat transfer viewpoint. First, the direction of the fluid flow is entirely wrong. The hottest solvent fumes will be at the bottom of the condenser and so the ethylene glycol will be heated there more than further above. The heated ethylene glycol will be less dense, so it will rise and set up a flow that is clockwise in the illustration above. Unfortunately, that means that the ethylene glycol will be moving in the same direction as the solvent - parallel flow. It is a basic principle in junior level heat transfer textbooks that counter flow (i.e., the solvent and the heat transfer fluid moving in opposite directions) is much more effective for heat transfer than parallel flow - you have a larger average temperature difference in counter flow. When there is flowing water in a condenser, it should be set up for counter flow, entering at the downstream point and exiting upstream. Further, the hot ethylene glycol has very few chances to cool. Normally the heat in the condensing fluid is either dumped down the drain or removed in a cooling section of the circulating pump, but in this case, the heat has to transfer through the rubber tubing to the air. Unfortunately, rubber tubing is a poor heat conductor; copper tubing would be simple to rig up, be much more durable and much more effective at transferring heat to the air. And yet the blessedly simple design works and works well according to data in the paper. So much for engineering theory. Which way to the firing squad? Somehow Harvard University was able to recycle old news as new-news last week, reintroducing "Shrilk" as a novel plastic. (Shrilk was first described in 2011.) And since it is based on biowaste, specifically chitan chitin (the shells of crabs, shrimp and other shellfish), it is a green option. The fly in the ointment that is not mentioned of course, is that only about 60,000 tonnes of chitan chitin are produced each year, and worldwide plastic production is 4666 times larger, about 280 million tonnes. So we better be eating more shellfish. A lot more. I hope the ocean can keep up with our hunger. While I mention this with regards to Shrilk today, tomorrow there will be another novel material and the same claims will be made over and over again, about how this will replace petroleum-based plastics. No it won't. The simple math above tells the same story over and over again and again. To completely replace petroleum-based plastics, you better have 280 million tonnes of starting material - per year. Globally, that is about 25 kg per person. So if you want to take a whack at this problem, go right ahead. But before you trumpet your brilliance to the ends of the earth, think long and hard about your starting material and also about that number - 25 kg per person per year. If you can find a bio-based waste source that large to use as a feedstock, you will have passed the first hurdle and you might just succeed. Anything short of that smells awfully fishy. May 13, 2010 - Followup on "The World's Smallest Rheologist"
I've already written a few time earlier (1, 2 and 3) of Dow Chemical's battle with activist investor Daniel Loeb. The last time I did so, I predicted that since Dow's plastics unit seems to be performing better (which was the main criticism that Loeb had against Dow), Loeb would go quietly into the night. While not the "open letter" that started this whole shoving match, Loeb has written extensively in his May 1st investor letter and is still on the attack. (Hat tip to The Chemical Notebook blog for pointing out this letter.) His new battle is about transparency in transfer costs, a term that you probably are not familiar with unless you've worked in a large corporation that is vertically integrated to some extent. Dow is such a corporation. They are basic in ethylene and other feedstock monomers that they can sell to outside entities or keep and use themselves. If they use it themselves, the company establishes a transfer cost, which is the price that the downstream unit pays the upstream unit for the raw material. This cost may be below what the outside market pays or it may not. As you can imagine, transfer costs are considered trade secrets. If an external customer knew that the Dow product they were buying had a higher margin than normal because of a low transfer cost, they could play a harder negotiation on price knowing that Dow could afford the price cuts. Loeb is suggesting that Dow has too low of a transfer price and that ethylene production should be making more money, but without knowing the transfer price, he can't be certain. While it is clear that Loeb will never find out the transfer costs for Dow materials, I also think he is fundamentally barking up the wrong tree. According to Wikipedia, Loeb has a degree in economics so he should have taken one or more classes in multivariable calculus. Unfortunately, he has forgotten some of the important lessons of it. Specifically, for a multiple variable system, the global optimum is seldom found by optimizing each variable independently. If you have four variables w, x,y, and z, you don't hold x, y and z constant and maximize w and then repeat for the other 3 variables. You have to look across entire ranges of the variables at the same time. And even once you do find an optimum, you have no idea if it is just local or it is the global optimum. But taking the former path is exactly what Loeb is seeking to do. He wants to optimize performance of each business unit separately rather than looking for a global optimum. While the VP's of each business unit do in fact seek to optimize their local performance, the job of the CEO is to find the global optimum. Whether or not the CEO is doing a good job of that is (always) open to debate, but pretending that a global optimum can be found by optimizing each individual business unit is amateur mathematics. P.S., Mr. Loeb, Please keep up the attacks on Dow Chemical. It makes it easy for me to find something to write about. May 12, 2010 - The World's Smallest Rheologist? Self-healing polymers took a big step forward today with the publication in Science of research from the University of Illinois (White in Aerospace, and Moore and Sottos, both in MatSci) showing a technology for self-repair of impact craters as large as 3.5 cm within hours. Frame A shows the initial setup. If you look closely, you see two thin streams of blue and red liquids in the glass. These are the components that make the repair - more on that in a minute. Frame B shows the glass after impact and the rough crater that was formed. The liquids are then pumped in the damaged area. Frame C shows the final repaired glass. Pretty neat, huh? While this an idealized and simple demonstration, its easy to see the authors proposed future would be to have networks of the two separate liquids within the material, not just the two straight lines shown here. The chemistry is more complicated than you might imagine. Each of the two fluids has two components with in it - a gelling component and a reactive monomer. The gelling components react first (within seconds or a few minutes) providing a scaffolding for the polymerization of the monomers that occurs over hours. The gelation is needed as surface tension could otherwise prevent the coverage of such large areas. The final product has 62% of the initial impact strength - not bad for an initial result. I've written about self-healing polymers many times in the past and have generally not had nice things to say about them (such as here, here or here). While 62% recovery is not great, the innovative and flexible approach demonstrated here is what I find exciting. There are plenty of chemistries that can be used in this setup and that versatility is what is so exciting. May 9, 2011 - Some thoughts on Choosing a Major: Chemistry or Chemical Engineering? Like most Americans, I'm not going to be watching any of the soccer/football World Cup matches later this year. As if boring matches weren't enough of a reason to avoid it, the 90-minute long drone of the Vuvuzelas from 4 years ago in South Africa still echoes in my head. You may recall that the Vuvuzela topped my list of alltime worst items ever made from plastic. 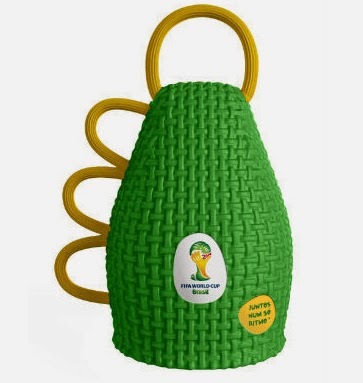 Not to be outdone (or more properly, seeing an opportunity to cash in as well with an officially licensed product), Brazil has commissioned an official replacement to the Vuvuzela - the Caxirola, a precussion instrument that is held in one hand. But even in the paradise of Brazil, there is trouble. According to Plastics News,"...here's the rub: the caxirola is made of rigid plastic and has the potential to cause a head injury if thrown with sufficient force or lobbed from a very high seat in the bleachers." Here's the rub? You mean the noise isn't already "the rub"? You mean there are other problems too? You mean NO ONE anticipated that a fan might just throw the thing. I'm not sure what it is like around the world, but here in the US, disgruntled fans throw whatever is handy - cups, food wrappers, even an Octopus if you plan ahead. Throwing a item that nestles in the palm of your hand would be a natural temptation. In fact, FIFA has already banned the caxirola from matches due to such concerns. Unfortunately, they banned it too far in advance of the tournament. Given so much time, designers have been hard at work using alternative materials and "...Caxirola 2.0 is currently being tested. The new, improved noisemaker is inflatable rather than rigid and has a soft padded base. Also, the finger loop is now soft plastic and cannot be used as brass knuckles..."
Brass knuckles? That's strike three. Get that thing out of here. P.S. The 2018 World Cup is in Russia. Maybe Putin will do us all a favor and outlaw all noisemakers. I might just watch a match in that case. I added a new blog to the blogroll – Innovations in Polyurethanes – by Geert Bleys, who has 25 years in the polyurethane industry. Geert takes a closer look each week at one new patent in the polyurethanes arena. This may seem to be of a narrow focus, but I’ve always stated that polyurethane chemistry (and of course, the kissing-cousin of polyurea chemistry) is one of the broadest play sets available, so there is plenty of innovative activity to be discussed. The write-ups follow a standard template of Title, Patent Number, Assignee, Date and then the “Gist” – Geert’s 1 or 2 line summary of the patent and lastly “Why it is interesting”, which is where the commentary is. The blog is available via RSS and email updates, and you can also follow the blog on Twitter (@PURpatents), and I would recommend it to anyone with direct, or even passing interest of polyurethanes. Last week, I mentioned this article about how ExxonMobil is expanding its activities in plastics production. I also mentioned how I thought the commentary of the author was pretty inane, but didn't get into the details at that point. Now I will. "...Exxon is treading dangerous waters by exposing itself to the same type of risks the rest of its portfolio is vulnerable to. A large portion, if not all, of Exxon’s portfolio is exposed to the potential shifts in industry and politics regarding climate risk." First off, this follows the same old "let's pick on ExxonMobil because they are so big and no one likes them and they are an easy target" habit that I've previously discussed. Absolutely they are big, but they are only one part of the whole plastics industry. Anything said in the article against ExxonMobil can be said just as well against any other company making plastics from petroleum-based feedstocks. But secondly, the author is completely oblivious to that fact that the same equipment that ExxonMobil is investing in can be used to make the exact same plastics [*] from biobased feedstocks. Ethylene can come from petroleum crackers and it can come from ethanol dehydration facilities and the reactors can't tell the different. In both cases, the polyethylene plastic that is produced is the same. This means that investments in polyethylene production equipment, as well as equipment for polypropylene and any other other Big 6 polymers is an investment in the continued dominance of those plastics in the future. They are not merely investments in a petroleum-based economy. "While it could possibly be an important source of revenue down the line, this transition into plastics leaves Exxon open to the emerging technology of bioplastics, a technology that is showing increasing promise..."
Biobased plastics, both now and in the future will be one of two varieties: they will either be drop-in replacements for existing materials (such as the bio-based polyethylene I just mentioned) or they will be novel materials that don't currently exist and fulfil a niche need. Polylactic acid (PLA) is a good example of this. The former is much easier to achieve success in since the processing equipment, markets, engineering specs, regulatory approvals, etc. already are in place. The latter option is far more challenging to achieve success in since the materials are new and few people know they exist or understand (and trust) their performance and the new materials may not have the needed regulatory approvals. I already mentioned the dominance of the Big 6 plastics. They, HDPE, LDPE, PP, PS, PVC and PET, account for 76% of the plastics market. That dominance resulted from the ability of these six materials to affordably meet the needs of a vast array of products. While it might be possible to chip away at some of the applications and replace them with new materials, that dominance will effectively remain in place for decades to come. The market share might drop to 75% or 70% or even 50%, but no one is seriously suggesting that these materials will not remain the Big 6. I don't know whether ExxonMobil's investments are a good idea or not. My concerns however, are only about the ability of the markets to consume the additional output and not in the least about them using petroleum feedstocks. Looking forward 100 years from now, I would expect the world's energy supply to be from anything but petroleum, but I would still expect to find a world filled with polyethylene materials. [*] "Exact"? Not quite. The biobased feedstocks will have some C14 that petroleum feedstocks won't, but you need some pretty good mass spec analysis to find that. The glass transition of polymers, Tg has always been a little difficult to talk about because it seems to violate so much basic physical chemistry. For instance, the measured Tg depends on the rate of cooling. And sometimes the measuring technique. And then there is the whole whole physical aging thing, where a glassy polymer, in which the polymer chains can't move [*], shrinks over time, with the amount of shrinkage also depending on the initial cooling rate. As I've said many time before, I seen 3 settings where I thought arguing scientists would start throw fists, and two of them involved the glass transition. All of the macroscopic observations of the glass transition in one simple diagram. Let me give you a rundown. Temperature is on the x-axis, and volume or another thermodynamic quantity is on the y-axis. Glass transitions are usually thought of as occurring during cooling, so the plot is best viewed right to left. Starting in the upper right, the cooling polymer initially follows the thick, solid line - the "equilibrium liquid". At some point the temperature drops below the melting temperature, Tm and the liquid polymer is now supercooled. The slope of the volume vs. temperature between in these two zones is the same, but at some point, the kinetics can't keep up anymore with the thermodynamics and so that slope starts to lessen forming the "Out of equilibrium glass". The spot where the slope bends is the infamous Tg. For a polymer that has undergone physical aging, it is possible to describe it with a new temperature, Tf, the fictive temperature, as shown in the illustration. Chains with the same fictive temperatures all have the same thermodynamic state, one that is equal to a polymer with Tg = Tf. Lastly, in the lower left corner is the Kauzmann temperature, Tk which is when the glass polymer has the same thermodynamic state as the crystalline one. A controversial idea to say the least and one that has never been physically observed. To quickly comment on the energy landscapes on the right hand side of the image, the polymer initially cools in state (a). If it could, it would go to state (c) and crystallize, but it ends up in state (b), where it slowly works back towards state (a). At a cool enough temperature, the two valleys of states (a) and (c) have the same minimum value. So there you have it. The glass transition clearly presented. While I've seen figures before that have various bits and pieces of this information, I've never seen it all come together in such a fashion before. This doesn't eliminate any of the controversies, but it does make it clearer to see where they lie and what significance they have. [*] To paraphrase Galileo, "But they do move!" May 5, 2010 - GM up to it's old trcks? Tip O’Neill, the long time Speaker of the U.S. House, was famous for saying “All politics is local”. The same can be said for recycling plastics: All plastics recycling is local. The plastics that are recycled in my community – and the amount of sorting required by the consumer – will be different than in other communities. There are no state or national regulations on this matter. Even within a given metropolitan area, the core city can have one set of rules while the suburbs may have entirely different sets. It’s all up to the locals to work out the intricacies of recycling plastics. Just looking at my local area, St. Paul will take plastics 1 (PET), 2 (HDPE), 4 (LDPE), 5 (PP) and 7 (Other), but not 3 (Vinyl) and 6 (PS). They also don’t take plastic bags, but note on their website that you can take them to local grocery stores for recycling. Right next door in Minneapolis all plastics except expanded polystyrene are accepted. And no bags either, but the site makes no mention of the recycling options that St. Paul's site did. In expanding the circle a little, St. Cloud, Minnesota takes only 1 through 6, and Brainerd, Minnesota doesn’t have a recycling program at all [*]. It's local market conditions that cause these variations from place to place. If there is demand for the recycled resins, the materials will be accepted. [*] Maybe because they once got body parts in their chipped wood at the composite site. May 2, 2012 - I'm that Guy (My most viewed post of all time). But over in Europe, the message is mixed. DSM for starters is in, but it appears that Bayer is heading for the door, focusing instead on its pharma and ag-chem businesses. That was somewhat surprising to me as Bayer is not a player in the Big 6 commodity plastics, but instead in polyurethanes and polycarbonates, materials that have higher margins associated with them. Bayer's plastics business is worth over $10 billion, so it's a pretty sizable company on it's own, or for someone to buy in its entirety. Regardless, its not as though this plastics business is going away, anymore than when GE sold its plastics business off to Sabic. It just going to take a while for this old chemist to associate the Bayer tradenames (Desmodur, Makroblend, Bayflex...) with a new company. [*] The cynical side of me interprets "the foreseeable future" as Wall Street does - the next quarter. Chrysler's Bankruptcy - The Firrst Domino?